Panthers Beat Senators In Straight Sets. 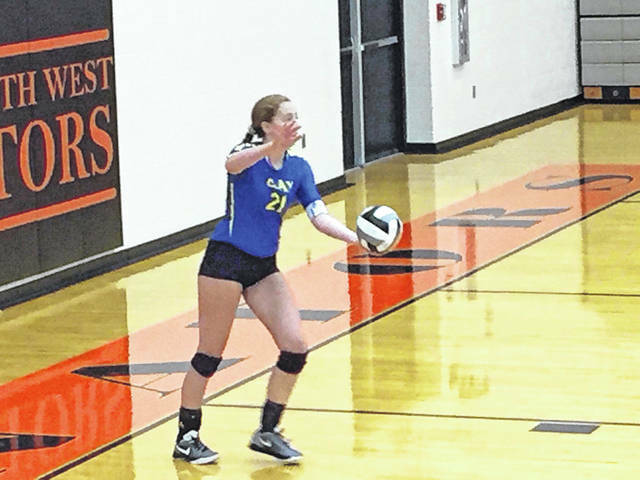 The Clay Panthers defeated the Portsmouth West Senators Monday evening in straight sets in an inter-conference match. You couldn’t ask for a better outcome for the Clay Panthers on Monday night as they cruised to a straight set victory over the Portsmouth West Senators 3-0 . The night started off well for the Panthers as they quickly jumped out to a 7-0 lead behind Delanie Gilliland’s seven straight service points. West would continue to battle back as they cut into the Panthers early lead and forced a timeout, with the score now 15-9 still in favor of Clay. The Senators had the momentum on their side coming out of the timeout and brought themselves to within striking distance of the Panthers with a 17-12 score. But the early hole proved to be too much for the Senators as the Panthers offense took back control of the first game and won the set by a final score of 25-15. The Panthers would carry their momentum from game one into game two as they raced out to an 8-1 lead in the early going. Panther senior Jensen Warnock would have a dominate night as she was looking to smash the ball all over the court in route to a match leading eighteen kills. “Jensen had a great game at the nets, she’s a big hitter for us” said Hammond, “She brings us all together; everything she does is very smooth. She is a big hitter, a big blocker, good server, good passer, just a smart player all the way around.” Jensen and the Panthers would extend their lead as they forced a second West timeout with the score 16-2 in favor of Clay. The rest of the second set would continue to go the Panthers way as they cruised to a 25-8 victory. The Panthers looked to finish the night on a high note going into the third and final set as Warnock continued to impose her will around the net. The Panthers would start the final set of the night with a 10-2 lead going into West’s first timeout of the set. Not to be out done by her fellow upperclassman, Gilliland was all over the court Wednesday night. Gilliland would prove to be a huge service weapon from the line as she served on four of the panthers final five points to win the 3rd set 25-8. “She’s a great server, a real aggressive player for me on that back row,” said Hammond. The Panthers next return to action Thursday night in a road trip to Willow Wood to face the Symmes Valley Vikings. The Senators will next face the Wheelersburg Pirates on Thursday in an SOC II matchup. https://www.portsmouth-dailytimes.com/wp-content/uploads/sites/28/2018/09/web1_Clay.jpgThe Clay Panthers defeated the Portsmouth West Senators Monday evening in straight sets in an inter-conference match.